Want to break free of the 4/4 routine? Add some odd time drum loops to the mix! Covering 3/4, 5/4, 5/8 7/4, 7/8 and 9/8 time signatures, the Odd Time Meltdown Series serves up the odd meters that will shake up your songwriting. If you write fusion or rock-based odd time projects, add some live odd time signature loops. Instead of the stiff, lifeless feels MIDI always seems to deliver, get the real thing. 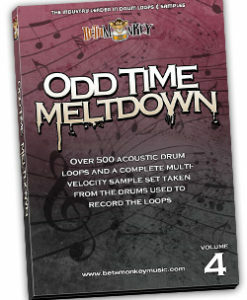 Unquestionably, the most versatile odd time drum loops you’ll find anywhere.